On a warm summer evening of Monday, July 13, 1908, Max Kämper took a break from his cartographic masterpiece. Hotel manager Marty Charlet gave a porch party for guests. The Glasgow Daily Times reported: „The piano was moved onto the spacious porch of the hotel and Mr. Max Kaemper of Berlin, Germany, delighted the crowd with some excellent music on the violin accompanied by Miss Mayme Depp of this place“. Friday, october 10, 2008 Mammoth Cave National Park celebrated the centennial of Kämper`s visit. Members of the Kämper family had crossed the Atlantic , back to the place where this remarkable map was created. Among them Max´s grandson, renowned cellist Klaus Kämper. History repeated itself when Klaus performed musical compositions from Max´s era, accompanied by concert pianist ans Mammoth Cave guide Janet Bass Smith. For about 270 people who listened live to this concert it was a „once-in-a-life-experience“. 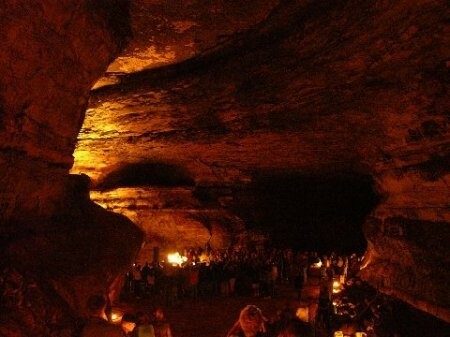 For everybody else these videos give a chance to feel the spirit of one of the most unusual concerts in the history of Mammoth Cave.